Discover Napa Wineries From A Luxurious Vintage Train If you're in search of a remarkable wine tasting adventure, hop aboard the Napa Valley Wine Train for a luxurious journey through California wine country. Relax in luxurious vintage Pullman train cars, featuring rich mahogany paneling, etched glass partitions, velveteen armchairs, and brass accents. 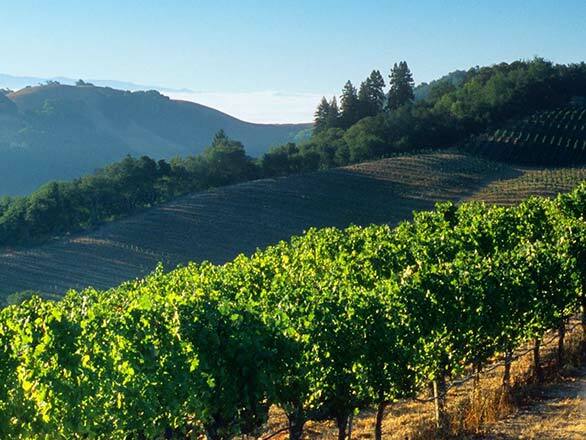 The 3-hour excursion takes you on a 36-mile journey through the scenic Napa Valley and includes a gourmet lunch or dinner of chef-prepared California cuisine. Enjoy the views as you travel through the valley to taste vintages at the Castle Winery, Raymond Winery, Grgich Hills, and Ambassador Winery. For a truly unique experience, book one of the special event tours like the Rock The Rails, Murder Mystery, Meet The Maker, and seasonal holiday celebrations. Delight in a luxurious 3-hour train excursion through the Napa Valley. Enjoy a gourmet lunch or romantic dinner in restored turn of the century train cars. Take part in events like estate tours, celebrity winemaker dinners and private twilight tours. Napa Wine Train tours starting at just $146 per person. Save on Wine Country Getaways At Our Calistoga Retreat Calistoga Spa Hot Springs is the ultimate destination for wine country relaxation after the excitement of your Napa Valley Wine Train excursion. Settle in to contemporary rooms and enjoy soothing mineral pools, stimulating mud baths, restorative yoga classes, and renewing spa experiences. Tour, taste and talk with local winemakers then unwind at our Napa retreat when you book our spectacular Calistoga wine tasting package. Book now!